Please note: my method of upgrade might not suit your site – e.g. if you’ve got lots of custom configurations and plugins installed then this might not work. As always, test it on a local copy first and back everything up! My preferred method of upgrading Umbraco is to take a live copy – freeze content updates (see how your users like this!) – upgrade locally, test thoroughly and then upload onto a new instance on live and switch over. I couldn’t do this as I didn’t have as old a version of SQL Server as my host uses and there is no way to downgrade MS SQL Server DBs. Instead I did the upgrade twice but locally I fixed my XSLTs and then just copied those over live after the 4.5 upgrade. If you have a busy site I’d suggest you change the site to point at a holding page and use a test subdomain or similar as you upgrade / switch over live. 1) Backed up *all* files and the DB. Check that you’ve definitely done this! 2) Run a local copy to do the upgrade – you’ll possibly have to spend some time reviewing and updating your XSLT files (I took the pain rather than running the legacy support). 3) Copy your web.config – I constantly copy the umbracoDbDSN key into each upgrade. 4) I went the long way around and installed each and every upgrade (see my path below). I’ve ignored the notes where it says to do patch upgrades and instead copied all files each time heeding any warnings to delete certain files from the bin (everything will break if you miss these – in fact if you hit any weird errors check these files are gone) but I had a site with very little changes from the default configs – if you have special settings you should be merging these. 5) Watch out for the .NET upgrade – you’ll hit some web.config errors on your host (of course errors might be masked / as in your server doesn’t send these to the client browser) – change your settings. Hint for SoftSys hostees, if you upgrade the Umbraco (most importantly it’s the web.config) before changing the .NET version you’ll actually break their website control panel – to fix it copy up an old web.config (that doesn’t rely on .net v4) and then modify it and copy it back. 6) v4.5 is obviously the biggie as the XSLT format changes. I upgraded each of my XSLT files using the online tool though you need to go through looking for instances such as ” <xsl:for-each select=”$towns/node ” – I’d search for /node and rewrite these as per the examples on http://our.umbraco.org/wiki/reference/xslt/45-xml-schema/xslt-examples-updated-to-new-schema – there is an online tool here http://blackpoint.dk/umbraco-workbench/tools/convert-xml-schema-to-45-.aspx?p=2 but I think it’s better to check and amend yourself. 7) v4.7 throws a few XSLT errors that seem to sort themselves as you go. 9) v4.8 also seems to loose resolving mydomain.com/umbraco and you have to put the full /umbraco/login.aspx for reasons I don’t understand! 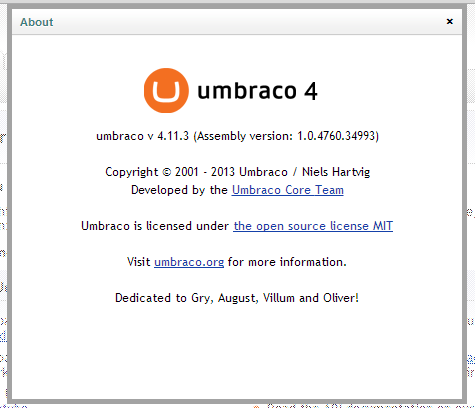 And there we are – a 4.11.3 upgrade Umbraco. Soon to be upgraded to v6! As I write this I notice 4.11.4 is out too! 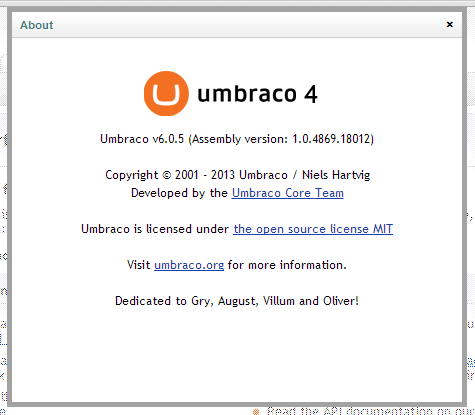 And there we are – a v6.0.5 upgraded Umbraco. 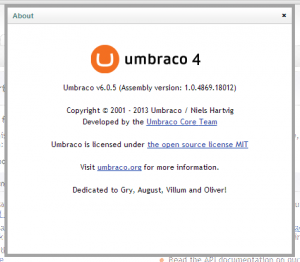 I was wondering, where can I find a copy of Umbraco 4.0.4.2 to begin the process?? Can’t find it online anywhere! Aurelie… It looks like they’ve deprecated the releases on Codeplex (which was used before the move to GitHub). Looking at my notes that was an unnecessary step anyhow but I’d test a jump to 4.5 on a local copy and ensure you have good backups. I probably have the download at home but I’m in Peru and won’t get my hands on my laptop for a few months. 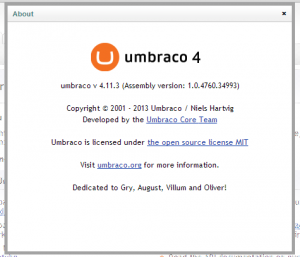 Lee Kelleher has a wonderful archive of old Umbracos for anyone with a problem like Aurelie!